Narragansett Town Councilors and a General Assembly representative continue to advocate for a new location and additional landscaping for the salt storage shed that abuts Route 1 and the Dillon Rotary. Town Council President Pro-Tem Susan Cicilline Buonanno said she toured the site Monday with Rep. Teresa Tanzi (D-Dist. 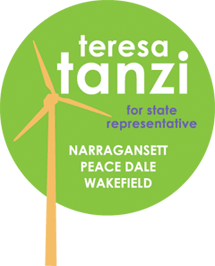 34) of Narragansett, Peace Dale and Wakefield, and state Department of Transportation officials. Cicilline Buonanno and Tanzi said a resolution was not secured. As a result, the Council voted 5-0 to issue a letter to DOT officials and Governor Raimondo. Buonanno and President Matthew Mannix requested the item be placed on Monday’s agenda. Tanzi said she had asked DOT for a list of state-owned land between Charlestown and Wickford, which she considered a significant enough range to still provide salt to the area. According to information shared by Narragansett Community Development Director Michael DeLuca at a July 20 Town Council meeting, and the letter approved by the council Monday, the town was not given a copy of the landscaping plan until days before construction began, despite consistent requests and a promise from then-DOT director Michael Lewis that the town would have input. The letter is addressed to Raimondo, DOT director Peter Alviti, Tanzi, Rep. Carol Hagan McEntee (D-Dist. 33) of Narragansett and South Kingstown, and senators Mark Watkins Gee (R-Dist. 35) of East Greenwich, Narragansett, North Kingstown and South Kingstown, and James Sheehan (D-Dist. 36) of Narragansett and North Kingstown. At issue are two large, older trees near the rear of the salt shed, which block some of the view from the Narragansett-South Kingstown town line. Tanzi said in her conversations with DOT and National Grid, she learned the trees would have to come down once the National Grid electrical substation that will service the Deepwater Wind transmission line went live. Tanzi pledged to continue to call for compromise on landscaping and for the shed’s eventual relocation.